Our drag-and-drop email editor makes it easy to create beautiful messages that can be used for a wide variety of email sends: a newsletter, product announcement, promotion, or triggered email, like welcome series or order confirmations. Add special links with the click of a button, including links to user-specific unsubscribe pages and to web views of email content. 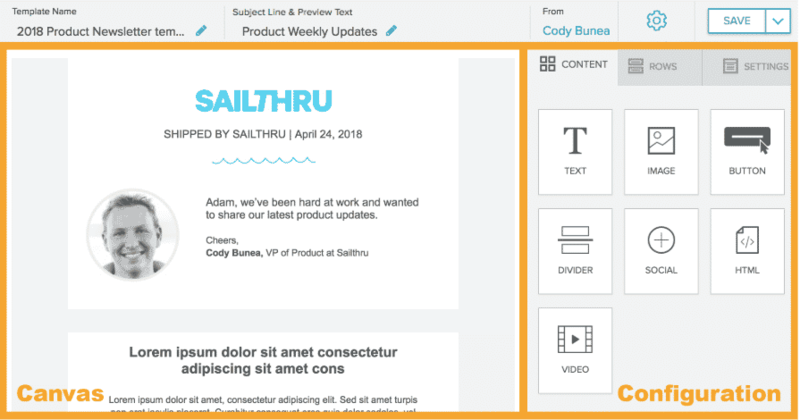 Email Composer is currently great for fulfilling ad-hoc email needs, but for emails that will include dynamic article or product recommendations, or require custom Zephyr logic or CSS styles, we recommended that you instead use Sailthru’s HTML Template Editor. Note: As of 03/06/2019, the beacon is automatically added to the top of your Email Composer template instead of the bottom. Any templates created before 03/06 will not be affected. If this is your first time building templates for Sailthru, or you’re building a new type of template for the first time, be sure to discuss your plans with your Customer Success Manager. Your CSM can ensure you are using Sailthru’s best practices for template design and email strategy. Within the Sailthru interface, email templates created with Email Composer are labeled as visual templates while others are labeled HTML templates, but both can be selected and used by our system in the Campaign workflow, Lifecycle Optimizer, and API. Here’s a high-level look at the process of building a new email with Email Composer. In My Sailthru, on the Templates page, create a new visual email template. In Email Composer, drag in the desired structure blocks (to represent the email layout), then drag content blocks into them as needed. Common content blocks are text areas or images. For each content block, you can edit the content–write text, select an image, etc. You can also choose to hide content on mobile. Preview the template in both desktop and mobile formats, then send a test email to yourself or your team. Select the template in a Lifecycle Optimizer flow. In My Sailthru, from the Communications menu, select Templates. Enter a Template Name in the New Template box and select the Template Type “visual email”. Optional: If your account has Teams enabled, you can restrict this template to certain teams. To add a team, click the gray bar and select a team. Repeat to add more teams. The template is visible and usable by all employees in your Sailthru account if you don’t select teams. Click Create Template. The new template opens in Email Composer. Click “Not Set” under Subject Line and Preview Text to open the editor. Enter your preferred Subject Line and Preview Text. Click Apply to add them to your template. Click “Not Set” under From to open the editor. Enter your preferred From name and From email address. You can also enter a Reply-To email address in this editor. Click the gear icon next to the From options. This opens the Template Settings editor. In the first tab, select your Content & Data settings. In the second tab, select your Links & Tracking settings. Finish designing your email with Email Composer. You can find your email by the Template Name you set in the first step. It will be referred to by the Template Name throughout the Sailthru platform. Configure settings for your templates in the Settings editor. Select an existing data feed to dynamically populate variables from your site at send time. Select your promo code source from the drop-down menu. Select this option if you’re building a Transactional template. For more information, see the Transactionals Overview documentation. Add advanced Zephyr configurations to filter or sort the data feeds used in the template. Setup runs once for each customer send. This allows the Zephyr used to help personalize template variables, anything from the personalize function to setting a date to be included in URLs. Learn more in the Zephyr documentation and examples library. Customize link rewriting behaviors from the Links & Tracking tab. Note: Link tracking must be turned on for Sailthru to track link clicks. Turn on Link Tracking to track link clicks from your emails and attribute those clicks back to unique users. Turn this option on to identify traffic coming from your emails in Google Analytics. utm_campaign: will automatically be the name of the campaign as it appears in Sailthru. utm_medium: will automatically be “email”. utm_source: will automatically be “Sailthru”. utm_term: will automatically be the name of the sending list as it appears in Sailthru. utm_content: if you are sending an AB Split or AB Winner or Auto Winner Campaign, this utm parameter will be added to your links. For segment A, the value will be “A”, for B, “B” and “Final” for the Final version of the AB Winner/Auto Winner test. 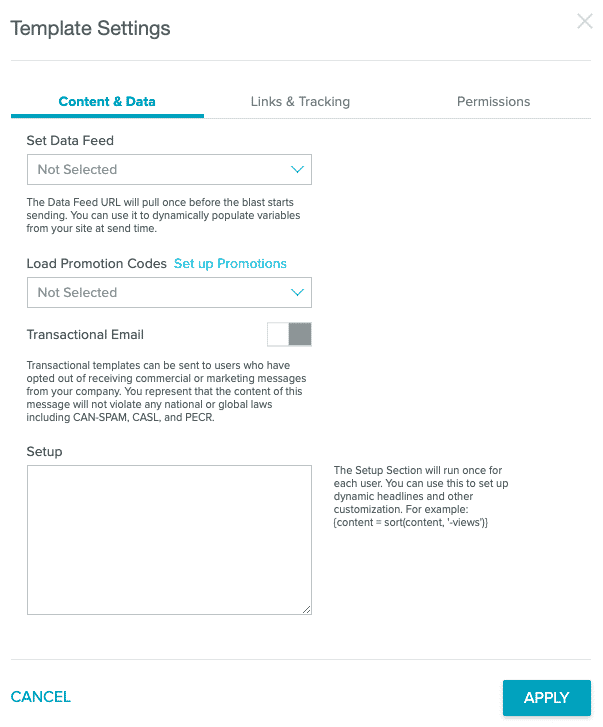 You can use Google Analytics independent of Sailthru Link Tracking. Select a link domain from the drop-down menu. Set the domain in your My Account section if you want Sailthru to rewrite the links in your email to point at your subdomain, for example, link.test.com. Set team permissions from this tab. Select your team or teams from the dropdown menu to give them access to your template. Note: You must save your template to confirm the changes. If you do not save your template, the team permissions will not be applied. Email creation and editing is divided into two main areas. 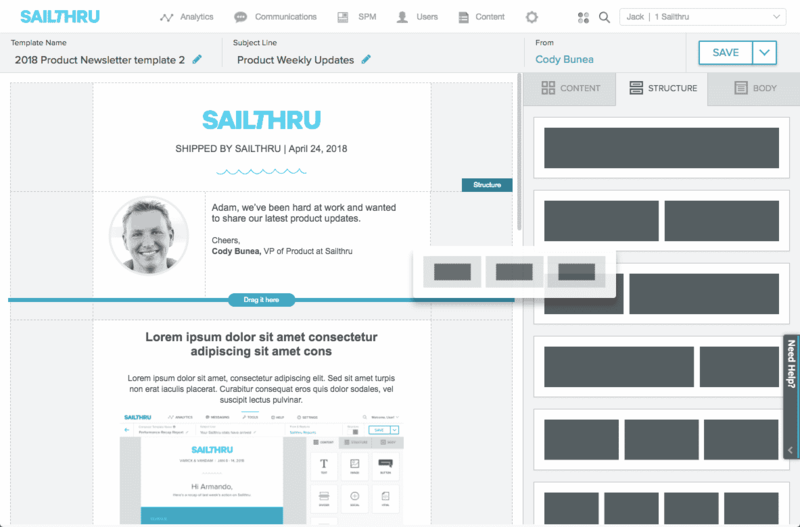 The Canvas, where you will drag and drop content and structural elements to view the progression of your email’s design, and the Configuration panel where the drag-and-drop options and their properties live. The Configuration panel has three tabs to help control the appearance of your email: Content, Rows, and Settings. On the Settings tab, you can set global properties for your email. Content area width – Set the width, in pixels, for your email’s body. This is a fixed width and only applies to desktop. 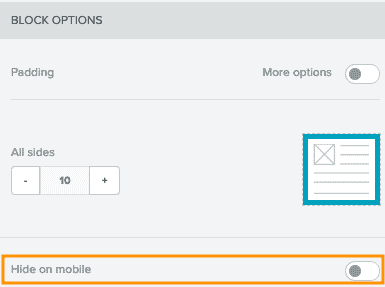 When viewed on a mobile device, your structure is converted to a single column that matches the width of the user’s device. Background color – Set a default color to apply to the background of your email. Choose transparent to not set a color. Content area background color – Set a color to apply to the content width area of your email. When used in conjunction with the background color it can create a distinct area to highlight your message. Default Font – Global font used for all text, except any text blocks where you have specified a different font. Link Color – Set all links, including newly created links, to a specified color. The rows can also be stacked on top of each other. For example, a three column structure could be placed beneath the hero image’s single column, to display three featured products or articles. The use of the editor’s column structures helps ensure mobile responsiveness without any extra configuration or code. By default, adjacent columns will stack on top of each other when the email is viewed on a small screen. Columns that run left to right will display top to bottom. There is, however, an option to disable stacking for any email. Now that the layout of your email is in place, add the visual components by dragging them from the Content tab into a row. Multiple Content blocks can be added into one row. 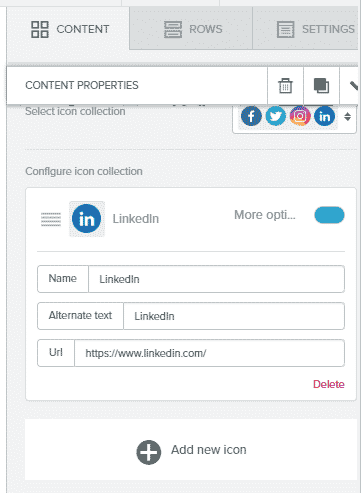 Content blocks already in place can be reordered or moved to a different structure by selecting them, then clicking and holding the access arrows while dragging to the desired location. Once you add your first content block, you’ll see an Undo option appear in the lower left corner of your canvas. The buttons include Undo, Redo, and a History icon. Selecting the History icon shows a timeline of your last 15 edits within the current browsing session. The content blocks create the primary visible elements of your email body. Each of the content types is described below: Text, Image, Button, Divider, Social Icons, Video Link, and HTML Block. Every block’s padding, or separation, can be set in its Properties panel under Block Options. You can also choose to hide content when an email is opened on a smaller mobile screen. Best Practice: Use a Text Block for Zephyr scripting. To add text to an email, select the content tab and drag the Text content block into a structure. You will see the following text appear. Note that if you set the font family to Global Font, it will inherit the font family selected under the BODY tab. This allows you to change the font family for multiple elements at once just by changing that property in the Body tab. If you want to use web fonts from sites like Google Fonts, ask Sailthru to include the font as an option for your Email Composer messages. To be accessible in customers’ emails, the font must be a web-accessible font. If you use Typekit fonts, see the Custom Font Resources section. Note: Some email clients, such as Gmail, will not render web fonts. We highly encourage you to provide us with a recommended “font-family stack”, which should include a web-safe font or general font family style (such as sans-serif.) For more information on font-family stacks, see the Custom Font Resources section. Locate the font’s link on Google Fonts or a similar site. You can request an unlimited number of fonts. Send the name of your account(s), the font link or links, and your recommended font family stack to Sailthru Support. A team member will confirm the font addition or respond with further questions. Once successfully submitted, please allow up to one week for the a font to be added to your account. If you have any questions, contact Sailthru Support. Learn more about web-safe fonts with Mozilla’s documentation. The Image block comes with an image uploader to receive your images. You can either drag an image file on top of this block or click “Browse” to reuse images from your account or other services. You will have several methods for uploading images, including a file upload, upload from a URL, import from services like Instagram, as well as a free image search. Note: The maximum allowed file size is 12MB. All image file types are allowed. By default, images will automatically be sized to fit the structure within which they are contained. This is the recommended setting to ensure images resize correctly for any screen. However, you can disable automatic sizing and set the image to be a percentage of the structure’s column. Use the Properties panel to set the alternative text as well as any destination URL. If you intend on populating the image with a dynamic image like a countdown timer or an advertisement, you can select “dynamic image”. This will allow you to set a dynamic image for the send while still viewing a sample image in the composer. Insert a call-to-action button that can open a web page in the user’s browser. Alternatively, buttons can be set to send an email, make a call, or send an SMS from the user’s device to your chosen recipient. Selecting the text of the button in the canvas will provide a limited text editor. The action and destination URL are set in the Properties panel, where you can also set the button’s background color and text color, border, width, and roundness. A customizable horizontal rule. For an invisible spacer, set to Transparent. A configurable set of social network buttons. Choose a design in the Properties area, then configure which networks to include and your ID/address for each. 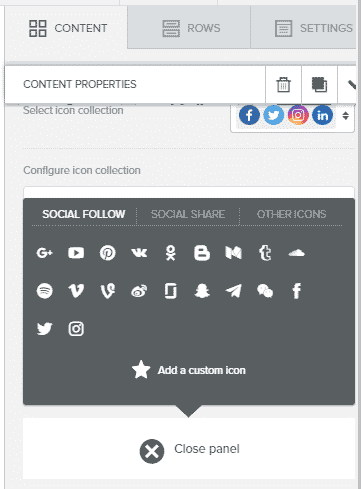 You can also include custom social buttons by clicking Add new icon. Using your own code may affect how the message is rendered. Make sure to use correct and responsive HTML. Where possible, is recommended to build with the editor’s options instead, to ensure code is valid and the design is responsive. Note: Some characters used in Zephyr will not render correctly in an HTML block. These characters include double quotes (“”), angle brackets (< >), and the ampersand (&). To render Zephyr correctly, use a Text Block. Add a YouTube or Vimeo URL to automatically generate a preview image. The image will link to the provided URL in a new tab. You can quickly check what your email will look like on desktop or mobile sized screens. In the dropdown on the save icon, select “preview”. This will take you to a new view where you can toggle between a larger desktop view and a 320px mobile screen. To test the email in real email-client apps or share it with other stakeholders, you can send a test email. In the dropdown on the save icon, select “test send”. These sends have the word [TEST] prepended to the subject line and will not contribute to any reporting. However, in most other respects, they will resemble production sends. When you click “test send”, you can specify the recipient address. Once an email template has been created, visual or html, it can be used in the rest of the Sailthru system. You will need to select templates in Lifecycle Optimizer for any of its email-related actions. Lifecycle Optimizer is ideal for user-specific triggered or transactional emails like a welcome series, purchase confirmation, winback message, or password reset. To start a flow from an email send, open, or click you will need to select the relevant starting action. You will be presented with a list of the templates in your account representing your emails. Choose the appropriate email’s template. To send an email as an action, you will again be presented with the list of templates in your account including both visual and html emails. Individual mass mailings can be built from scratch in Sailthru or they can be partially created using a template to configure the email. Campaigns will accept both visual and html templates, however, Campaigns don’t support the Email Composer tool so subsequent changes will be HTML only. To use a template in campaigns, create a new campaign. Name it and select the type of campaign. Templates are supported in all campaign types: Regular, A/B Tests, and Recurring. After your campaign is created, navigate to the Configure tab. The first option is to “Build Your Campaign From a Template”. Select this and choose the template from the dropdown. Choose “Dynamic” if you want the email rendered uniquely for every user or “Static” if any dynamic elements should be rendered before the send. If you do not know, dynamic is generally what you will want. 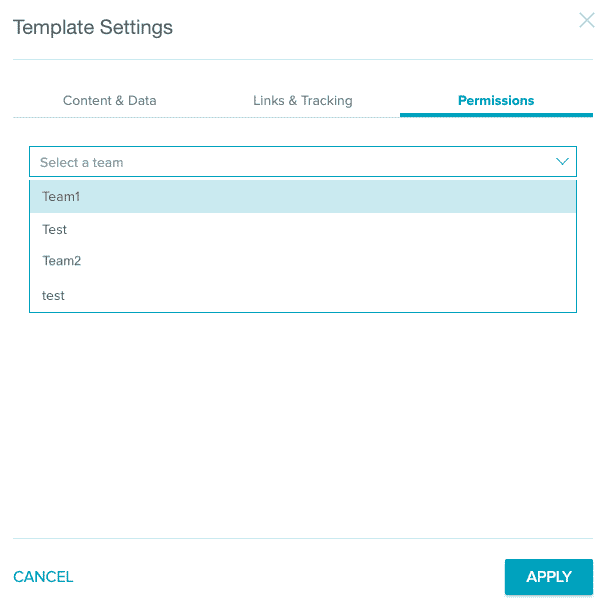 Choosing a template will overwrite the existing campaign fields with the template’s settings. This includes the subject line, from name & email, as well as the HTML of the email. This however does not happen in the other direction. Changes made in the campaign builder will only apply to that campaign and will not affect the template. Triggered/transactional email can also be sent using the Send API when specifying one or more recipients and the name of a Sailthru template. See the documentation for more details on the Send API.